A lot of people have lived in London over the years. In fact, in the 1800s and early 1900s, London was the largest city on the planet. Of course, some of those people were bound to be famous. To celebrate her famous citizens of yore, London puts up blue heritage plaques on houses were the famous have lived. Just the other day I was walking down a street in my new neighbourhood to find a plaque listing that the first President of Israel, Chaim Weizmann , lived for a time in my neck of the woods. 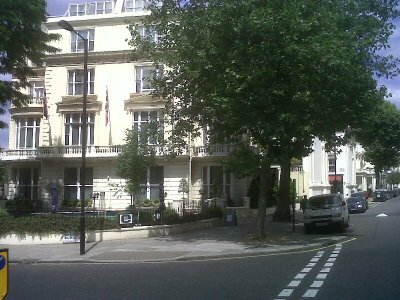 Mr. Weizmann’s fellow politician and Israel’s first Prime Minister, David Ben-Gurion, lived near Paddington station in Maida Vale. It was to Maida Vale that I was drawn recently to see a blue plaque. This one wasn’t for an Israeli politico, though. It was to see the birthplace of Alan Turing. Many of you probably have never heard of Alan Turing, unless you studied computer science (like me) or have an interest in World War II code breaking. Turing was born on the 23rd of June, 1912 at 2 Warrington Crescent, Maida Vale, now the site of a rather nice looking hotel. He was a naturally gifted mathematician, and went on to study mathematics at King’s College, Cambridge. He started working for the Government Code and Cypher School, and when war broke out in 1939, Turing started working on breaking German codes at Bletchley Park, 40 miles to the north-west of London. After the war, Turing moved to the University of Manchester, where he developed some of the most important concepts in modern computing, including work on artificial intelligence. The end of Turing’s life was not a happy one. During a criminal investigation regarding a break-in at Turing’s house in 1952, Turing was exposed as being homosexual. Still illegal at the time, Turing was convicted of gross indecency and agreed to chemical castration to avoid jail time. Despite being hailed as a hero for his work in code breaking during the war, he lost his security clearance and was barred from further work in code breaking for the government. A few years later Turing’s body was found in his home. He’d died of cyanide poisoning, ingested most likely from a cyanide laced apple. The death was ruled a suicide, though his family have suggested the death was accidently due to Turing’s poor storage of chemicals in his laboratory. Turing was only 42. Turing is now widely recognised as the father of modern computing and computer science, and his work at Bletchley Park widely hailed. In September of 2009, British Prime Minister Gordon Brown issued an official apology to Turing for his treatment. In 2002, Turing was ranked 21st in a publicly voted list of the 100 Greatest Britons of all time. There are a number of tributes to Turing around the UK and around the world now. 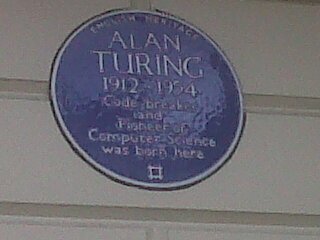 The little blue plaque just a few steps from Warwick Street tube station isn’t much as compared to the buildings named after Turing at universities across the globe, but it is a reminder of another great person that grew up in one of the biggest cities in the world. Next up, I'll have to see if I can find the house of Charles Babbage.